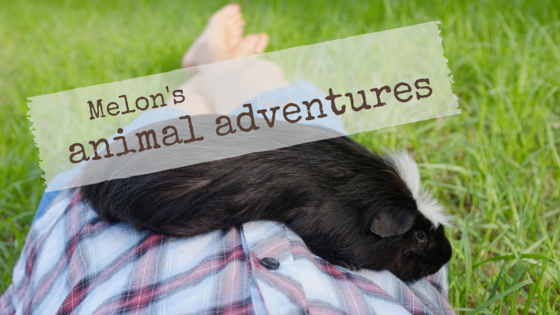 Melon's Animal Adventures: I'm back! Wheek! Guess who. Yup, it's me! ... you do remember me, right? So first, welcome to my new followers! I read all your comments very carefully. It's great you stopped by and I hope you stick around! My hooman Melon is gonna try to be a bit better with being my typist. And to my faithful friends, sorry for not being around; I know I've got a lot from you guys to catch up on! Melon has missed you too. I think she's still got serious dog envy; she checks out every dog we see on the street! Humph! Why would she need anything other than me? Cocoa - you have very nice eyes - you don't have to be a puppy dog for that. Nice to see you and say hello to Melon for us. Coming from the kings (and princess!) of beautiful eyes - Huskies - that means a lot! Thanks for stopping by as always. Melon says hi back to you Woos! Cocoa and Melon - where have you been?! We've been looking for you and wondering what you've been up to. Hope all is well and we hope to see another post really soon! Aw thanks for thinking of us, acd6pack (incl. Breeze and Twiggy)! We're still here and not much has changed really, Melon was just struggling a little to get around to helping me update my blog. Oh, and she's so much of a perfectionist that once she misses a post she won't read the new ones until she's read the old ones! Sigh. So you can see how we get behind! I'm sure your humoon loves you lots and lots, so don't sulk too much!